Karl Schmidt, a radio dramatist who hosted and produced programs for Wisconsin Public Radio for more than 70 years, died suddenly and peacefully Thursday at his home at the Oakwood Village Retirement Community in Madison, Wis. He was 93. Schmidt began his career at University of Wisconsin station WHA-AM in 1941 while a student at the school. 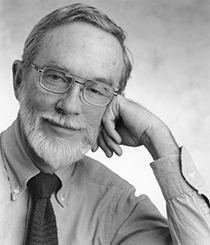 He was a founding board member of NPR and an associate chair of the National Association of Educational Broadcasters. In the 1970s, he got funding from CPB and the National Endowment for the Arts to create Earplay, a widely aired series of original radio dramas. Contributors included Edward Albee and David Mamet. For decades, Schmidt also hosted WPR’s Chapter a Day. The weekday show featured Schmidt and others reading excerpts from classic and contemporary works of fiction and drew a devoted audience. Schmidt was born in Canton, Ohio, and acted in regional theater in his youth. After joining WHA in 1941, he left college to join the military during World War II and served as a broadcaster on Armed Forces Radio in the Pacific. Schmidt returned to Wisconsin after his military service to finish his education, then went to New York to begin a career in radio theater. That attempt didn’t pan out. So he returned to WHA and worked in a variety of positions, including chief operator, director of radio, and director of the National Center for Audio Experimentation, which experimented with techniques for manipulating sound in various ways. 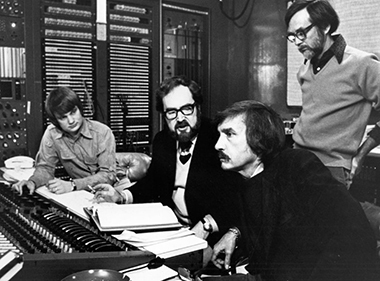 Schmidt, far right, with Tom Voegeli, John Tydeman and Edward Albee, working on Earplay. Earplay debuted in 1971, airing on about 100 stations. The radio drama program won a Peabody Award and a Prix Italia, the highest international honor for radio drama. Schmidt retired from WPR in 1986 but continued to read for Chapter a Day on a part-time basis. He was inducted into the Wisconsin Broadcaster’s Hall of Fame in 2013. The Hall of Fame says Schmidt likely holds the record for the longest career in radio in the state. Schmidt is survived by his wife, Joan; four children, Jeremy, Kate, Dan and Tom; and many grandchildren and great-grandchildren. His memorial service will be held at the Blessed Sacrament Church in Madison, Wis., Saturday at 10 a.m.